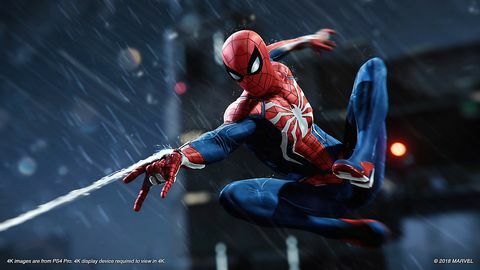 Insomniac's Spider-Man is one of the most anticipated games of the year, based on the immensely popular character with fans worldwide. 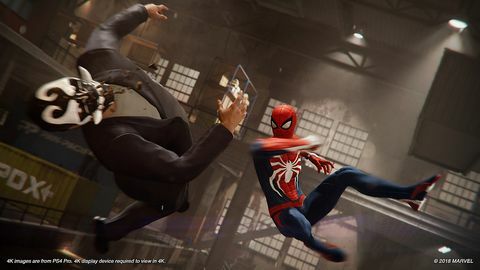 With that, there comes a huge amount of pressure to meet and exceed expectations, but having played the first couple of hours – we're quite sure Insomniac are going to knock this one out of the park. 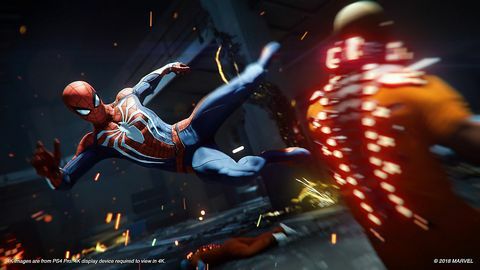 I sat down with James Stevenson, the community director at Insomniac to see what fans can expect from the upcoming Spider-Man game. Q: I did some creeping and noticed you went form Best Buy To Insomniac Games. That's a pretty massive change. How did that come about? Honestly I started working at Best Buy because I wanted to get a discount on an HDTV. I liked working there, so I stayed while I was in college. Having games retailer experience, working at Best Buy, both in terms of home theatre sales and also the media department was super beneficial for me, seeing that side of the business at the time. I was also a writer, so i did freelance work for Fandom.com way before it was what it is today. I also wrote for Videogamers.com, Cinescape Magazine, Laptop Magazinne and Surge Magazine. I wrote for Matt Birk and Andrew Reiner at Game Informer, so I wrote a lot about video games for years. That was how I came to know the guys at Insomniac. Insomniac needed someone to come in and help build the community around Resistance: Fall of Man for the PlayStation at the time that I left school. That was a really good thing so I left Nebraska and went to work there. 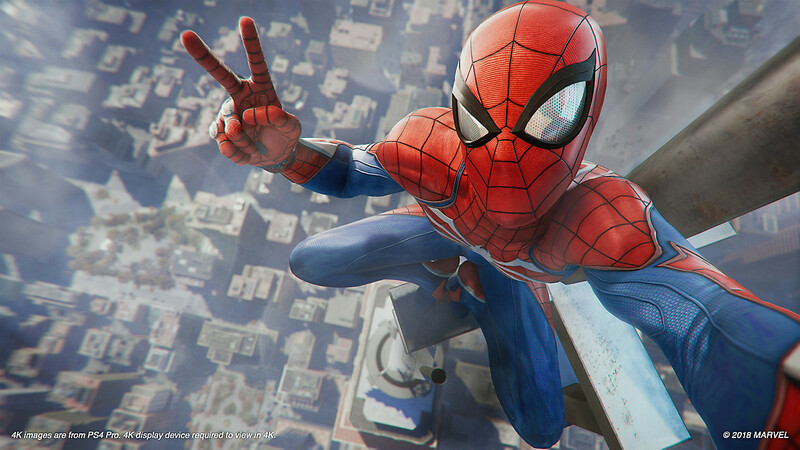 Q: How did the partnership between Sony, Marvel and Insomniac come about? About three and a half years ago, Sony approached us saying that they were working with Marvel. 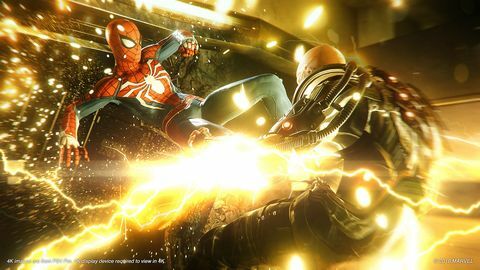 Marvel wanted the big Sony first party treatment for one of their characters and universes and they wanted to work with Insomniac. Sony wanted to work with us and with Marvel to make that happen. We were like "cool, which universe are you talking about?" and they said "no, no, no you can pick, here's everything. Pick which Marvel universe you want to do". It was very quickly obvious to us that it was going to be Spider-Man. 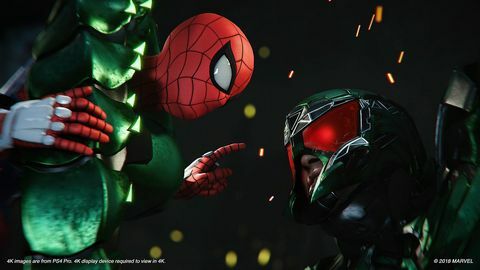 Q: So there weren't many other characters discussed initially at Insomniac? Well yeah, obviously you do your due diligence and throw some ideas around but it was kind of like this is the fit. Are we sure about that? No, it has to be Spider-Man; there wasn't even a close second pick. After making the decision we started working with Marvel and Marvel Games right away. Bill Rosemann, the creative director there and Mike Jones were great. 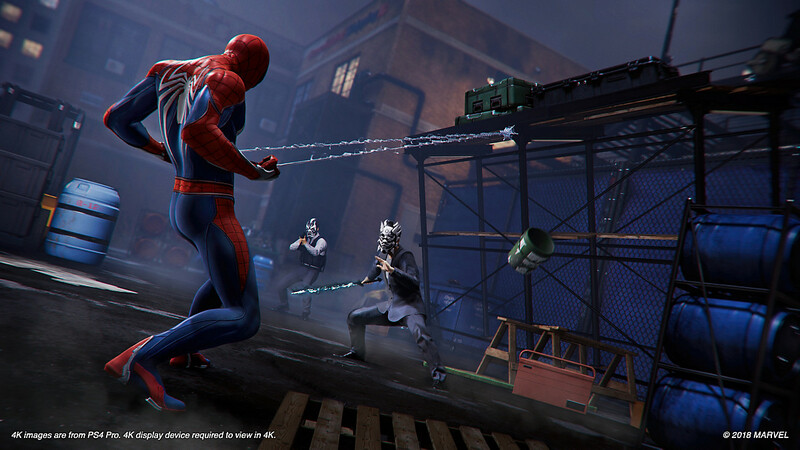 Early on we worked with Dan Slott, writing on the game as a consultant for the story. He ended up just being involved in the early stages. Christos Gage, another Marvel writer, who helped write [Netflix's] Daredevil Season One – and is writing the upcoming Spider-Geddon comic series – has been writing with our internal team for several years. It's been a really close partnership and collaboration ever since then. 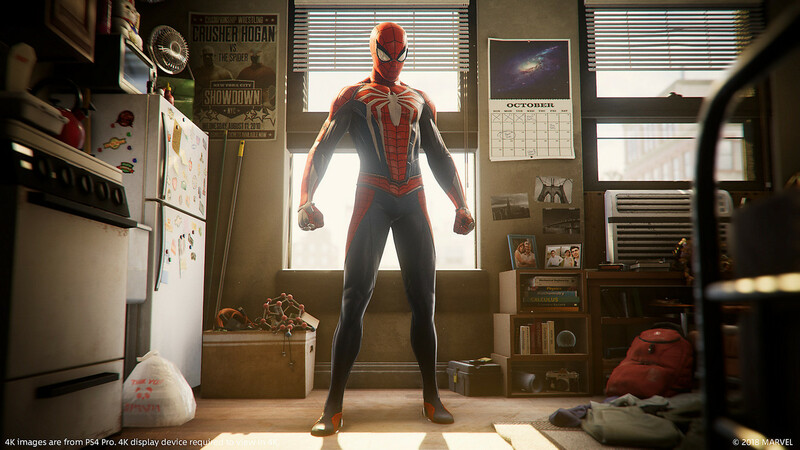 Q: What key lessons from previous Insomniac titles helped with the creation of Spider-Man? 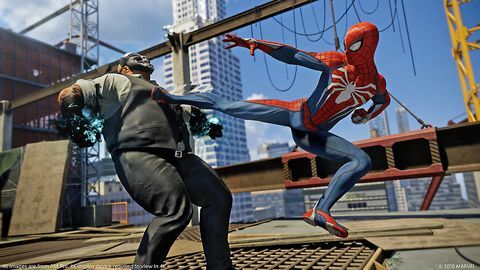 "Having that Insomniac sensibility, I think really matches up with the Spider-Man universe and was the goal for the story. You know to not tell just a superhero story, but to also tell a human one at the same time." We were coming off Sunset Overdrive, which was great form a DNA perspective. 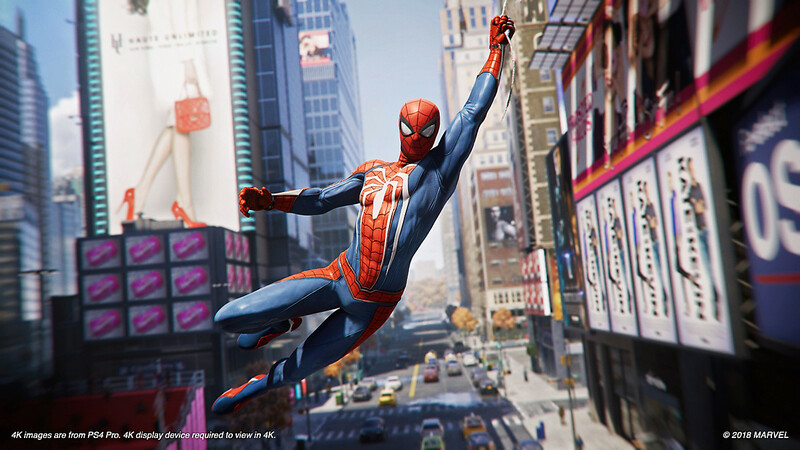 We thought it was perfect, we'd just made this open world game that's all about stylish traversal and Spider-Man is an open world game all about traversal which is critical. Obviously both games have very different traversal and a very different feel, but at least we're making something similar. I don't know how to describe it... maybe you were making a motorcycle game and now you're making one about racing cars instead. It's a bit different but we have some of the groundwork already in place to build an open world, and one you can move through quickly to build environments that are fun to interact and play with. I think all of those things helped. Our history for making gadgets from Ratchet & Clank and Resistance really tied into Peter Parker. I will say the thing we didn't have a ton of experience with was melee combat – we hadn't made a lot of melee games, so that was a learning curve on how we blend the uniquely Insomniac combat into that. Beyond gadgets and traversal were the stories we like to tell and the characters we like. If you think about Ratchet, Resistance and Sunset Overdrive, these are usually stories about underdogs who are facing overwhelming odds. Especially in the case of Ratchet & Clank and Sunset Overdrive; there's a lot of humour. There are these touching, meaningful stories that also have humour and fun to them. Having that Insomniac sensibility, I think really matches up with the Spider-Man universe and was the goal for the story. You know, to not tell just a superhero story, but to also tell a human one at the same time. Q: When was the decision made to forgo the origin story and instead see us take control of Peter as a more experienced hero? Very, very early. I couldn't tell you exactly when, but it was probably in our first few months that we decided to focus on a twenty-three year old Peter Parker – one that people maybe hadn't seen before. Everyone's seen the origin story many times. Even if you're not a huge Spider-Man fan, you've probably seen it in a cartoon, a comic or couple of movies. Like yeah he gets bitten by a spider and he now has powers. High school is interesting but people have done it already... Spider-Man: Homecoming is doing it great right now. We wanted to tell a story about a different time in your life and when we thought about it, we always think back to that. It's a really exciting time when you graduate university, you're getting your own place and your first job. Even if you haven't done that yet, you probably fantasise about it. Whether you've done it or are going to do it later, you can relate to it on some level. We thought there was a lot of fertile ground to tell a new coming-of-age story for Peter Parker. 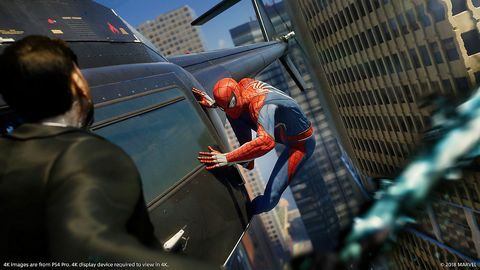 Q: Open world games can live or die by the amount of content outside of the main story - what other activities can we expect in Spider-Man? We have a big main story that's really great, but you're right, there has to be other stuff to do. We have this huge concrete jungle gym of Marvel's New York to play in and you've got to have stuff to do. One thing we tried to do is make sure everything has some sort of story element to it. "In our first few months we decided to focus on a twenty-three year old Peter Parker – one that people maybe hadn't seen before." Q: So we wont be chasing random balloons anymore? No, well I suppose that has the mild story of "the kid lost his balloon" but no you're not going to chase balloons. You may, yeah well...you'll see. It's always fun to chase dumb stuff when you're Spider-Man because chasing things is fun. We have some side quests that have stories and new characters you'll be introduced to. There are research stations that Peter's best friend Harry Osborn set up. Harry is away at school in Europe and has asked Peter to check in on his research stations, which are all environmental projects to help clean New York up. What Harry doesn't know is that his friend Peter is going to be using Spider-Man's abilities as well as Peter's own scientific prowess to speed some of the research up. With each one of those, you're going to hear a little bit about how it affects the city. There are some interesting boxes that have been set up throughout the city by a mysterious figure who is challenging Spider-Man in some way. You'll find Black Cat collectibles in the form of stake-outs – Felicia Hardy is back in town and she's been staking out these places and leaving them to torment Spider-Man, so you'll get a picture of what's going on with her. Another collectible is Peter's old backpacks. In a lot of games, you pick up a collectible and you get a message saying one of fifty, but each one of these has little piece of memorabilia from Peter's first eight years as Spider-Man. He'll also have a little something to say about them, so all of these things we're leaving are little clues about things that have happened. Gamers like to have combat challenges, so all of the factions, like Fisk's men have bases around the city. You can target these and uncover what they were doing. There's also the Inner Demons, you'll find out they have bases throughout the city which you'll need to eliminate too. On top of that, it wouldn't be Spider-Man if he wasn't helping to stop random crimes. You'll find robberies, drug deals, car chases and more. You'll find these go differently each time. One time you may stop a robbery and it'll go just fine. In the second, one of the criminals may jump in a car and you'll have to chase him through the city. Q: You previously mentioned that some crimes may change as the story evolves and the world state changes? Oh for sure. 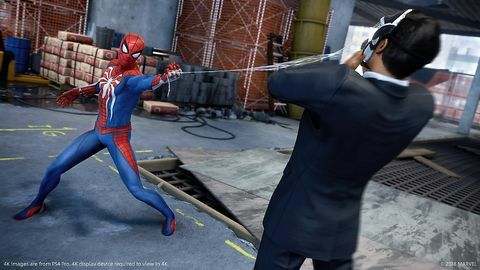 Early on in the game you'll just see thugs committing crimes because Fisk is gone, but soon the Inner Demons come onto the scene and you'll find them conducting crimes in the city. On top of that, the events of the story will have a big effect on the city and the type of crimes you'll see as the game progresses. Q: Ratchet & Clank, Resistance & Sunset Overdrive all had insanely over the top weapons. Did the team have to reign things in to be more in line with what Spider-Man would typically use? The best part is that Spider-Man himself is this sort of insanely over the top weapon. He's the acrobatic improviser, he's flipping off of guys, leaping, doing awesome finishers, using the environment against enemies, pulling down scaffolding on people, grabbing mailboxes and flinging them. He's also got all his cool gadgets like the impact webs which slam and stick guys against walls. There's the awesome air combat and juggling enemies. You'll build up a focus meter which you can use to do these awesome finishers or you can use it to heal. It adds a risk reward mechanic to the combat too. If your focus is full and you're low on health but there's a tough enemy with a powerful weapon on you, do you use it to finish him or to quickly heal? You're always trying to balance these things. We tried to give players lots of different options to approach encounters however they want and the opportunity to make the combat look as stylish as possible. A lot of the melee was new for us. In Ratchet & Clank you had the wrench and maybe a whip and then in Sunset Overdrive you had a few different options, so it was definitely one of the harder challenges for us in the game. Getting combat right, because we've never done a melee combat game so we spent a lot of time on it and I think we got it to a great place. Q: I imagine there is a ton of pressure to get things right. How have you found dealing with the community and gamers in regards to creating a game for such a beloved character? I like to say "With great power comes great responsibility". 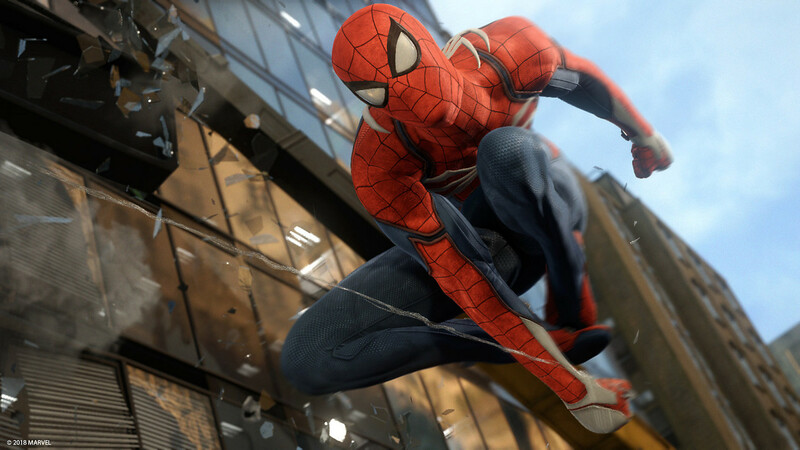 You're given the chance to make this Spider-Man game and he's perhaps one of the most beloved characters in the world. You have all of this rich history of fifty plus years of comics and all these incredible stories to draw from. It carries this expectation of "don't mess this up" and people are watching everything you do. It's fun though because, they're so passionate, we have to watch everything we do closely. It's so fun to put stuff in trailers where the team are like "is anyone going to get that?". Not only will they get it, there'll be an article the next day that will lay out everything in the trailer. Then there are these videos that are ten times longer that the trailer that get thousands of views. Fans break them down and look for all of the little easter eggs. We have things like the tail number on the helicopter being "AF15" for Amazing Fantasy 15, where Spider-Man made his debut. It's one of those things where its paint brush everywhere for us. We're just trying to bridle the fans passion. On the one hand we have a very strong vision. We're going to make the game of that vision and we hope people really love it. It's not a committee thing. On the other hand, we've made tweaks and fixes where we had feedback from E3 2017. People wanted to swing faster, so we sped the base web swing up. We just added lots of little things. People wanted to do tricks. They wanted a charge jump. So we've been able to add these kinds of things. We've focused on having that constant relationship with the community and trying to make the game we want to make. Some of the things people want may not make it, but we hope they also find things they didn't know they wanted in the first place. Q: Spider-Man has an enormous community of die-hard fans. 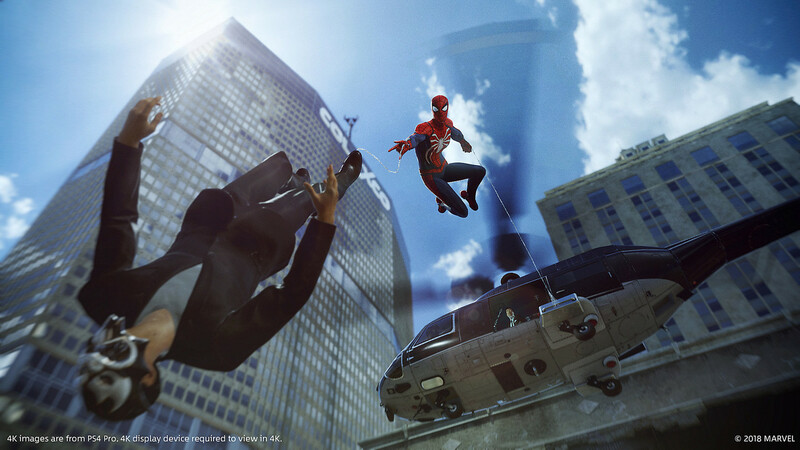 Do you feel like everything before should be treated as gospel, or are there certain liberties Insomniac have taken to tell the story it wants? Because we're not making a game based on an existing story, I don't think anything is gospel. 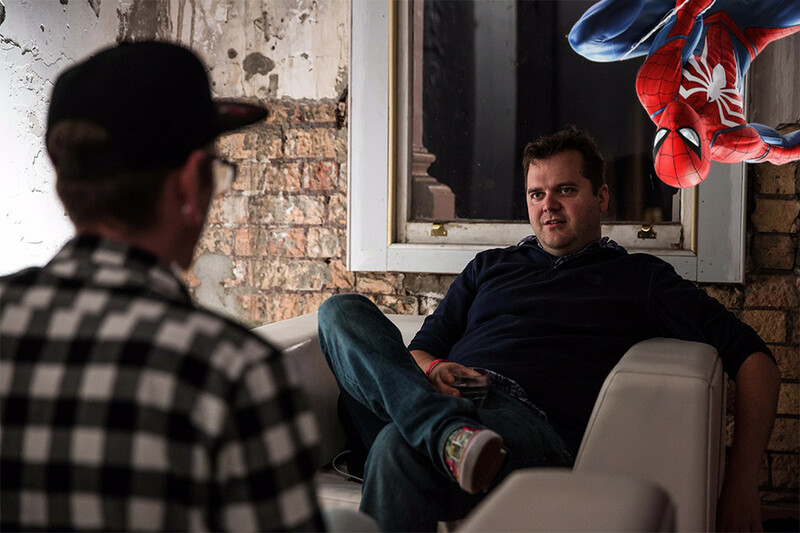 What's gospel for us is the certain DNA of the character and Spider-Man brand that we want to live up to. We want it to feel authentic, like it's a true experience. That means anything you've read in a comic may not necessarily have happened in our story. Norman Osborn is the mayor in our game, the big bad over the first eight years has been Kingpin alone. Our hope is that fans will have an experience that is authentically Spider-Man but surprises them and is fresh at the same time. You look at it now and you have studios making these amazing story games like Horizon Zero Dawn and God of War. It's been terrific having all of that institutional know-how and expertise. I think we've really upped our game. 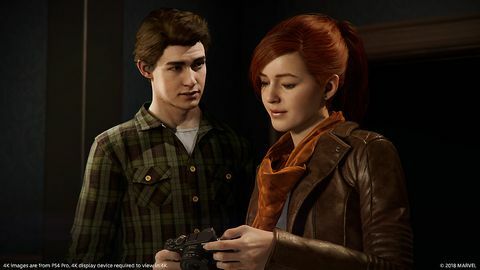 Q: With the introduction of Mary Jane and Peter Parker gameplay sections, how hard was it to get the balance right so players don't feel like they're being taken out of the action too often or for too long? I don't think striking the right balance was too hard. Looking at that overall flow, if you play the whole game and do a ton of side activities, the percentage of time you'll spend as those characters is pretty small. If you just play the story its probably a little more. The vast majority of the time you're playing as Spider-Man. With any sort of story, if you're pacing it out you have to have room for the story to breathe. You need time for emotional moments. You need these human moments. 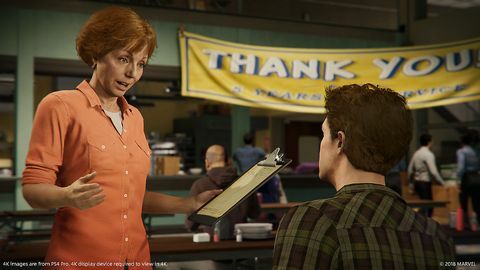 It's really hard for Spider-Man to interact with Aunt May so it's important to have those moments where you can be Peter and not just see that happen in a two minute cutscene . You'll actually walk around as Peter, experience the environmental storytelling and talk to the people there. You'll go to Peters work and can listen to audio tapes for more story or do projects and mini-games. You can do all of that, or if you just want to see the story and get back to being Spider-Man, you can do that too. I think for some players, they may decide that isn't for them. They just want to swing around the city. Others may want to dive into the world and really absorb all of it, so we've tried to layer a lot in there. We want to make it rewarding for the players that want to live and breathe that world for a little bit, but it's certainly not something that's required of them outside of the story critical moments. With any sort of story, if you're pacing it out you have to have room for the story to breathe. You need time for emotional moments. You need these human moments. Q: What benefits were there for once again making a PlayStation Exclusive Game? We've had such a great long relationship with PlayStation that it's very comfortable working with people like Connie Booth, Grady Hun and Mark Cerny. Those are folks we've worked with since, in some cases Disruptor and in others, Spyro the Dragon. We're talking about really long standing relationships. Amazing support all the way up to people like Eric Lempel, Shawn Layden, Shuhei Yoshida, Scott Rohde. It's been very comfortable. Everyone knows our strengths and what we can do. 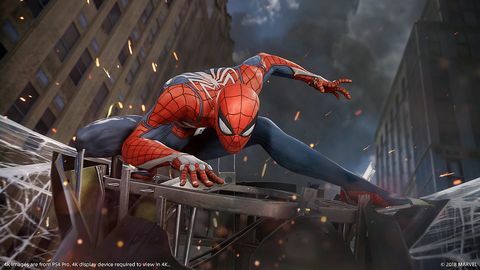 Obviously Sony first party has done a terrific job of supporting it's developers and making big single player stories and creating rich cinematic games. It's a template and a pipeline that Naughty Dog established. You look at it now and you have studios making these amazing story games like Horizon Zero Dawn and God of War. It's been terrific having all of that institutional know-how and expertise. I think we've really upped our game.e. I think we've really upped our game. This is the best storytelling we've ever done in a video game. Our partnership with Sony has helped bring that to the forefront. I feel like we always have been there. Go back to the PS3 era where we put out Resistance, Ratchet & Clank, Resistance 2 and Ratchet & Clank: A Crack in Time in the first three years. It was a crazy period where we had a ton of the best games on the PS3. I do think that from a storytelling perspective, the bar for creating these stories is now really high. We've told some great ones in the past but I definitely think we've learned a lot and have been challenged along the way. We've been really touched by the response so far. Q: Last Question, who's your favourite big screen Spider-Man? Tom Holland. I love Homecoming and think he's just terrific. I can't wait for Far From Home. He's so fun to watch. The Tobey Maguire movies though, that first one was mind blowing. To me it was "wow, I didn't know you could make a Spider-Man movie or even a super hero movie like this". I always say to the team, I hope the way people felt back then about that is the same as when they sit down to play our game. I want them to sit down and go "whoa, I didn't know you could make a super-hero game like this". That would be really cool. Hopefully people out there feel that way when they play. 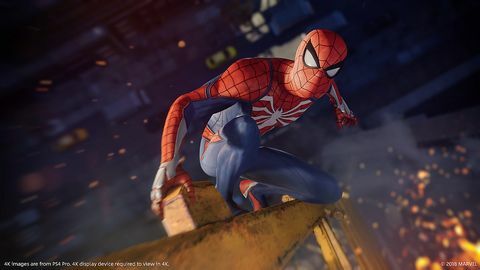 Pre-order Spider-Man now from Mighty Ape for release day delivery on September 7.